Although there are laws in nearly every US state to address texting and driving, many people cannot resist the urge to pick up their iPhone to answer or read that latest text or notification. 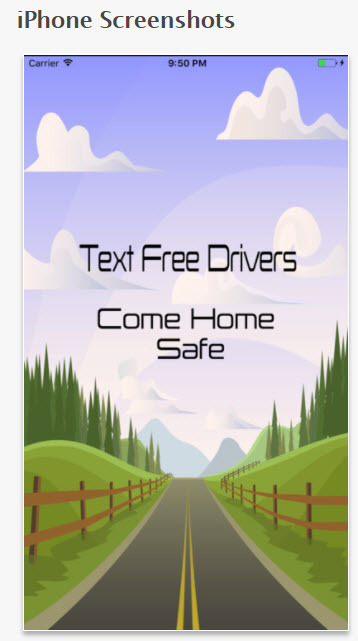 This app will not prevent a driver from texting while behind the wheel, it can be used as a deterrent and/or reminder to put the phone and arrive safely. The app is designed to sound an alarm when the phone is picked up from a resting state. The alarm is selected from one of the default alarms, or can be a personalized customized message can be recorded. Any photo can be added live or from Gallery to the recording was well. A recorded reminder from a loved one, close friend, parent, grandparent or brother/sister along with their picture might make the difference to somebody who has trouble resisting the urge to text and drive.